I would like to bring up the issue of teen molestation after hearing about a lot of cases in our own Dhaka City. It seems that no one is doing anything about it and even parents are unaware about what goes on inside their very own homes. Vulnerable teenage girls are being molested by their older relatives and are threatened to keep quiet. We must do something to stop these acts for the sake of the helpless victims and their psychological wellbeing. I strongly request the parents to talk to their children and make sure that nothing is going on and if anything happens the children can feel secure enough to talk to them about it. I would like to thank Imran H Khan for letting us know about the very recent multimedia development of Nokia mobile, particularly about the Nokia 5300 Xpress Music and Nokia 3250 Xpress Music. Cell phones are no longer just a device for talking; it also fulfils the unbound entertainment needs of people in today's modern world in many ways. Those who are music lovers can purchase one of the above sets since it provides huge space where one can keep approximately 1500 music tracks. In addition Nokia 5300 Xpress Music has a 1.3 mega pixel camera along with digital zoom, whereas Nokia 3250 Xpress Music also covers all the above features and also has a 2 mega pixel camera. Syed Nadeem Ahsan's impressive and heart-breaking remembrance on the December 22, 2006 issue of the SWM centring of his beloved mother was very touching. He expressed how miserably he had been spending his time in the absence of his mother. I cannot express in words how much sympathy I feel for such a tragedy. SWM deserves much appreciation for presenting such a write up to its readers. I wish Syed a safe departure to the USA from his beloved motherland. Bush finally got what he wanted destroying Iraq by sending former president Saddam Hussain to the gallows. It is a shame that the new Iraqi government decided to hang the former president on the holy day of Eid-al-Azha. 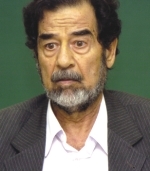 It is also a matter of disgrace for the Middle Eastern leaders that none of them raised any objections concerning the sentencing of Saddam in such a hasty manner. It remains a mystery to millions as to why Bush/Blair decided to finish the Saddam episode so quickly. If we take the theory that Bush/Blair wanted to capture the second biggest oil reserves in the world (Iraq) by eliminating Saddam then there were many ways of doing so. Or did they think that Iraq was in possession of deadly weapons of mass destruction of the chemical and biological kind and now are pursuing for nuclear armaments, which might pose a serious threat to Israel in the long run? However, all of the above proved to be baseless and fictitious. The question then remains as to what the actual reasons were that prompted them to get rid of the former president without due deliberation. It is also imperative to mention here that as predicted by our outgoing secretary general of the UN Kofi Anan that Iraq is on the verge of civil war was absolute right. Moreover, if Middle East keeps on conceding at the whims of both UK/USA, we are sure that one day Middle East will be ruled by these two super powers. This is in regard to the cover story published in the last Eid Special Issue of SWM (October 20, 2006). According to some people referred to in the article, religion is unnecessary. I would like to tell them to read the biography of Gautam Buddha. Though Buddha denied the existence of God, he taught people to be self-restraint, reserved and have a caring attitude towards humans and all other creations. Islam in particular and any religion in general should not give way to materialism. If modernism and materialism go unbridled who will be responsibility for the inevitable chaotic situation? The contradiction between Islam and modernism is nothing but the result of taking things at face value. On the other hand, the view of orthodox Islamists or 'mollahs' is not acceptable because they also take Islam at its face value. I hope young people will study more about Islam. First of all I would like to thank brand strategist Aftab Mahmud Khurshid for his informative piece of writing Branding Bangladesh 'in SWM (December 22, 2006). I strongly oppose with his view that ''we don't have anything unique to say''. How could we forget that ours is the only nation which fought for her mother tongue and also won a bloody war of liberation in only nine months. We have rich heritage sites of more than 200 years and some of them such as the mangrove forests of the Sundarbans have also been declared as world heritage site by UNESCO. We have the longest sea beach in the world and our people are known as the most hospitable to the foreigners. What we need is just to utilise all these in the proper way through print and electronic media. A peaceful political environment can attract more tourists in this country so I would like to call all the politicians to get rid of corruption and chaos to make this a developed country. Thus we can make this an attractive tourist spot for the foreigners and brand Bangladesh positively.